Yes! We've had FOUR summer days in a row - upper seventies to eighties - even in the nineties away from the lake. The flowers are beginning to do their thing in earnest. These photos are from yesterday, the 4th of July. It's been nine days since my last garden photos. The Dutch iris are done, the French lilacs, too. But the hybrid lilacs (Miss Kim, dwarf Korean) are still in full bloom, their perfume everywhere in the warm air. 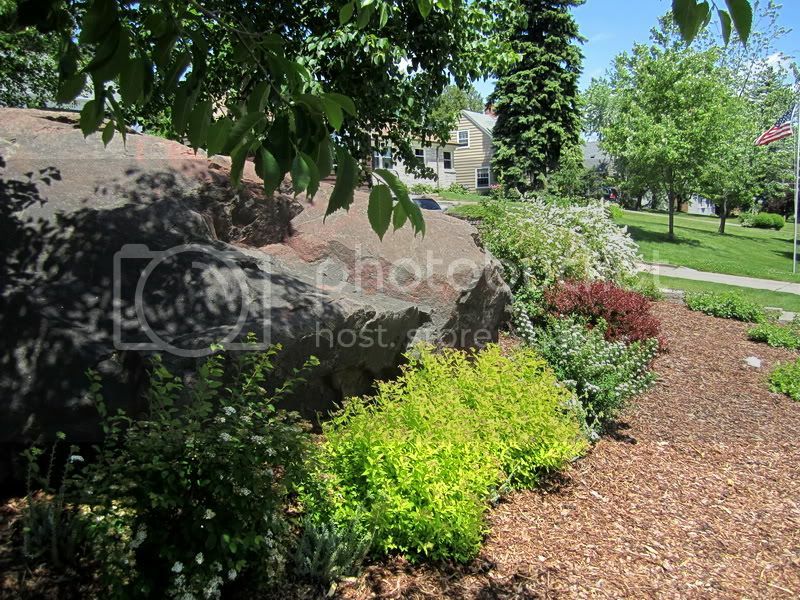 Also in full bloom are the yellow day lilies, Siberian iris and Snowmound spirea bushes. There are even some roses blooming. The garden is lacking in red/pink/orange, but those flowers are nearly ready. How pretty it will be. Here are those bushes around the big rock again. The big Bridal Veil spirea (not in the photo) are still in flower but past their prime. The little green bush above the red barberry is just coming into flower, a Snowmound spirea. 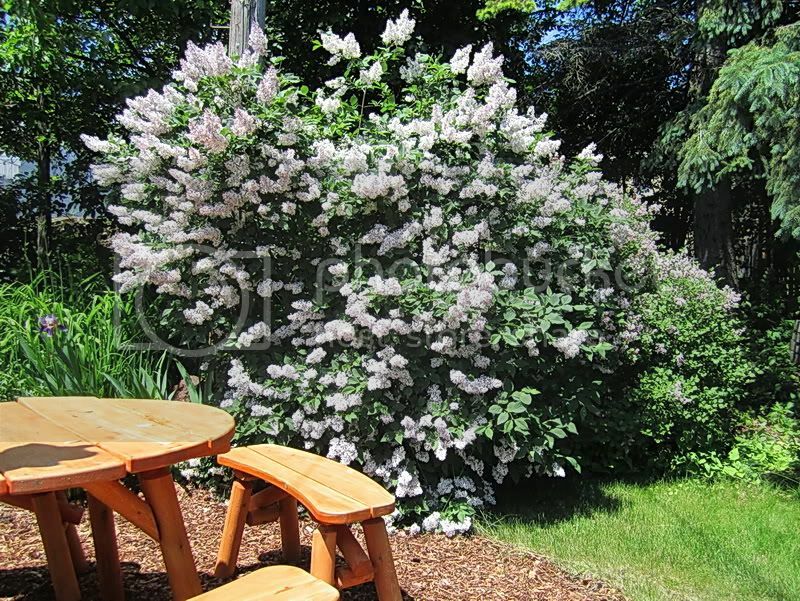 Here are those lilacs I was talking about. The big bush in the front in Miss Kim, the Korean behind. I should have planted the Miss Kim in back, but I didn't realise what a fast grower it would be. Here's a photo of the back yard, from the back corner of the house. You can see those lilacs up there behind the table and benches. In the foreground the first shrub roses are blooming, a red and a white. They're still quite small, only planted the year before last when the patio area was put in. This is the west side of the yard, looking into the back. 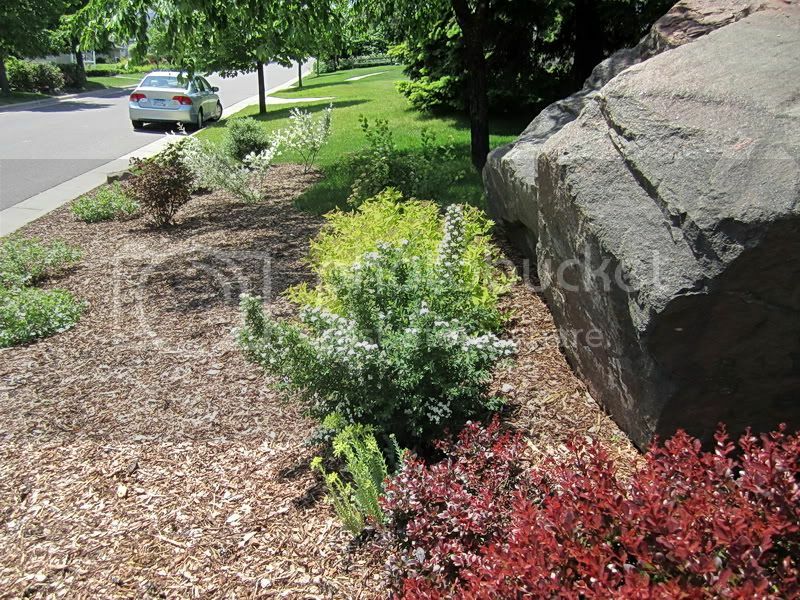 Those white flowering shrubs are the Tor Birchleaf spirea. The Cape Honeysuckle vine has the orange flowers, Siberian iris below and beyond it. 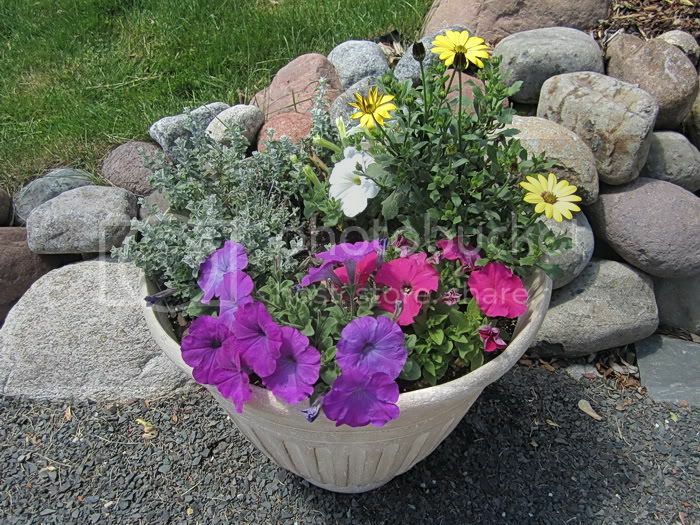 This is one of three big patio pots of annuals I planted this year. Last year I grew cherry tomatoes in them. Even though it was an extra-warm sunny summer, we didn't get very many. I'm so glad I planted flowers instead, this summer has been so cold. The annuals, planted at the end of May, nearly dormant during our cold grey June, are finally taking off and beginning to fill their pots. Yay! 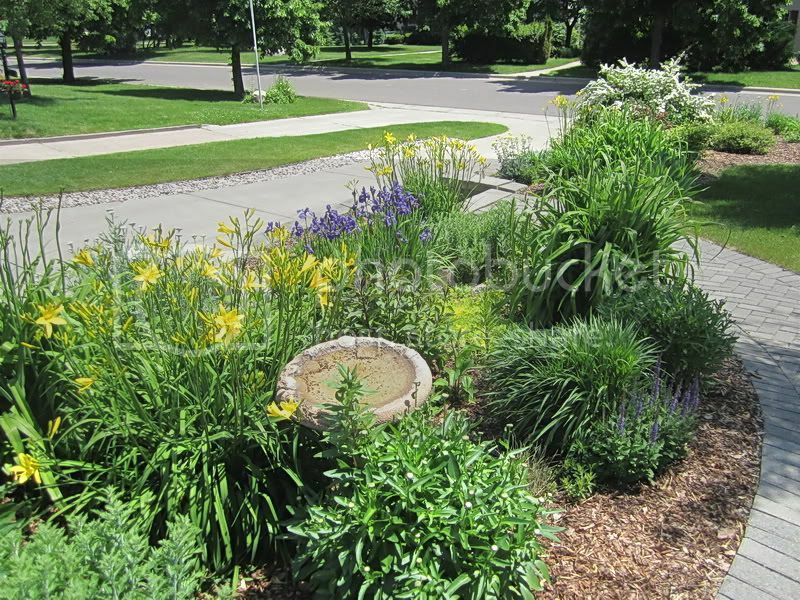 Here is a front garden shot to show the yellow day lilies. They are not only pretty, hardy and great growers, they have a nice fragrance. The purple-blue on the left is Siberian iris, the short blue flowers on the right are some salvia. Like most of the other gardens, this bed has tall orange day lilies, pink astilbe, red asiatic lilies and white shasta daisies, all nearly ready to bloom. How pretty it will look when they do. It will be weeks before the yellow rudbeckia, purple liatris, pink cone flowers and red monarda are ready, but I'll take a few photos when they come into flower. Beautiful! How Pippin would love that yard. Pippin would love it. But would it love Pippin? *g* Actually, a very aged beagle lives next door. She gets tied out in the yard and we can hear her. She doesn't whine or howl or bark; she bays, really bays, just like it says they do in the books. I was out on the balcony for hours on Sunday and Monday - just glorious!! This is the life I want! Yes, yes, yes! Wasn't it wonderful? I am sure you were enjoying the same weather system. It's still really, really nice. There was a short thunderstorm last night just before midnight, no damage, no power outages, just enough to give everything a good drenching. Whoopee! Wow! I really really love your garden. My garden looks like a huge catastrophe this year. It was too warm in April, the flowers grew and looked nice and then we had two bad frosty nights in May and all the little plants, sprouts got frostbitten. The rest of May and half of June was too dry - it seemed the plants grew backward. Then it was raining for about 3 weeks non stop and the lawn looked like a paddy field. And millions of snails attacked everything green. Now (they say) it will become very hot and dry for the rest of summer. Phewwww... I hope the flowers will recover NEXT year, LOL. But your garden looks like paradise. Are you a relative to Samwise? Nope, no relation to Sam. Just lucky this year. It's been wet, but awfully cool, so there's been no mold or mildew, no snail infestations. Just lush and green. but behind the season, in terms of flowering times. We had a very cold spring, so no one planted any annuals until the end of May or even June, just in case. Your weather this year sounds terrible, Julchen. Not your usual weather at all, am I right? But you've been so busy, or laid up, I'm in awe you have got out there to garden at all. The lilacs have been extra good-smelling this year, I think because they opened so late down here. They opened very late, and opened slowly, so that now that it's warm the hybrids are still in flower. Up the hill all the lilacs are done, but down here by the lake where it's cooler (last week it was 90+ degrees three miles from the shore but 57 at the harbour), they are having an extended season. Yay! Wow! More gorgeous photos. I have a "Miss Kim" lilac, too, and I know what you mean about it being a fast grower. I planted mine the same year I planted a white lilac, "Beauty of Moscow," and "Miss Kim" has grown about three times faster. In the last photo, are those stone pavers on the right side of the pic or the new synthetic pavers? Yours are beautiful. I have seen artificial stone pavers that look amazingly real. I need to look into that. I have a lot of paths in my gardens and I'm tired of picking pebbles and wood chips out of my flower beds. Dragging a garden hose along the paths scatters chips and pebbles everywhere. Yeah, the Miss Kim totally dwarfed the dwarf lilac. :) Too bad, because I actually like the Dwarf Korean better with its delicate little leaves. But they are way too big to move. I'm going to cut out the old wood in the Miss Kim after the flowers are done. That may help the ones behind it. The colour we chose in Millstone. 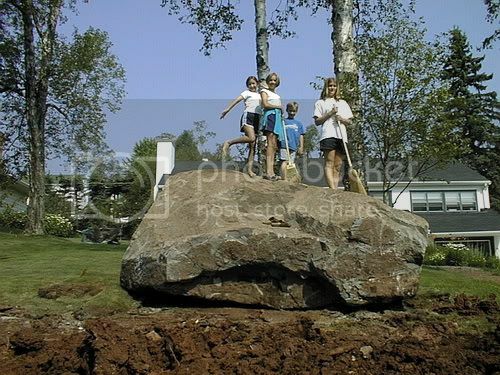 The round pebbly rock is Minnesota river rock and the dark sandy stuff for the paths is actually taconite (a low grade iron ore north of here). It's not round-edged like most gravels and not as fine as sand. It's flat and jagged-edged up close, so it compacts well and stays put. I like the contrast it makes too. ETA: The tumbled pavers I linked are only in the new patio, I should say. 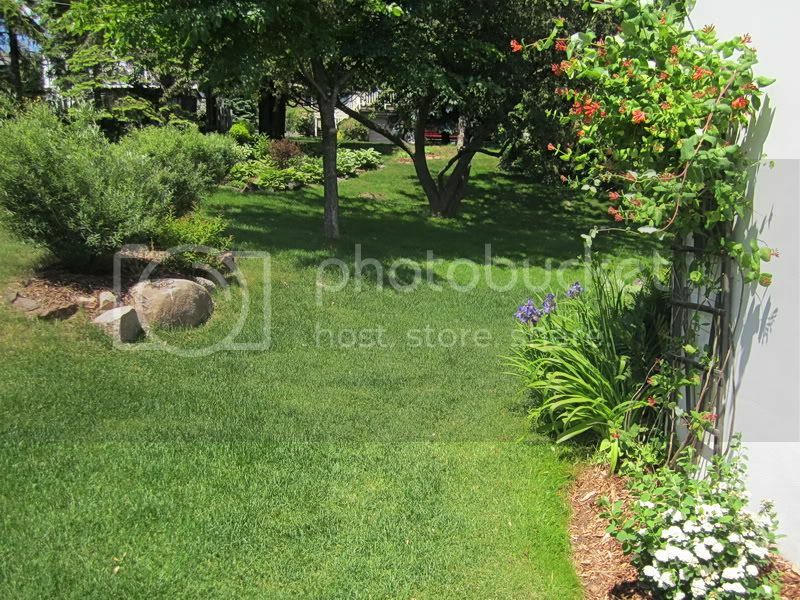 In the photo of the front garden, you can see the edge of a walk. 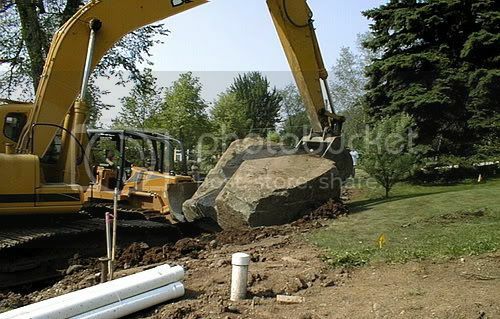 That was put in several years ago and is made from a type of less expensive holland paver, smaller, and not tumbled. The pavers are holding up well, although we are seeing movement of them, uneven places, as cycles of freeze-thaw and erosion from water running beneath parts of the walk changes the base on which they sit. Hmm. I'll bet we could grow taters. They are a cold weather vegetable. Peppers and Tomatoes and melons, very iffy. :) That is, down here right by Lake Superior. A few miles away from the lake and you can grow all those things. It's much hotter in the summer just a mile away. Your garden is lovely, Mechtild! And very, very neat. Ha ha! Yes, it does look neat. It always does before the plants finish growing up each season. Then they crowd each other nicely. The new shrubs and bushes will take longer to look less neat, they are still so small. Sam would want a very different kind of garden, I think. More like my father in law, who is a gardner for real. He doesn't just want to arrange plants into a nice setting (that's me), he revels in examining seed catalogs, looking for new varieties, then buying seeds and starting them in trays in the basement, to set out later, annuals and vegetables. He loves putting in a new garden every year, from the choosing and sprouting of the seeds to the harvest. He's a tremendous appreciator of the growth of the soil, I'm more of a decorator. It's a shame he can't do the gardening he used to do (he's 88), although he still manages to plant a few beds. Yes, Frodo would enjoy reading in this garden. It's quite nice sitting there in the sun under the umbrella (when it's opened up), or later in the day, the umbrella back down, when the sun is behind the tree tops to the west. There are squirrels and chipmunks to watch and loads of birds. When more flowers open there will be lots of honey bees and butterflies, some hummingbirds, too. Ahhhh.... Yes, our summer is very, very brief, but almost the sweeter for that. It's my favourite time of the year. We have rain here at the moment. I envy you your sunshine. I adore your garden.. every bit of it. 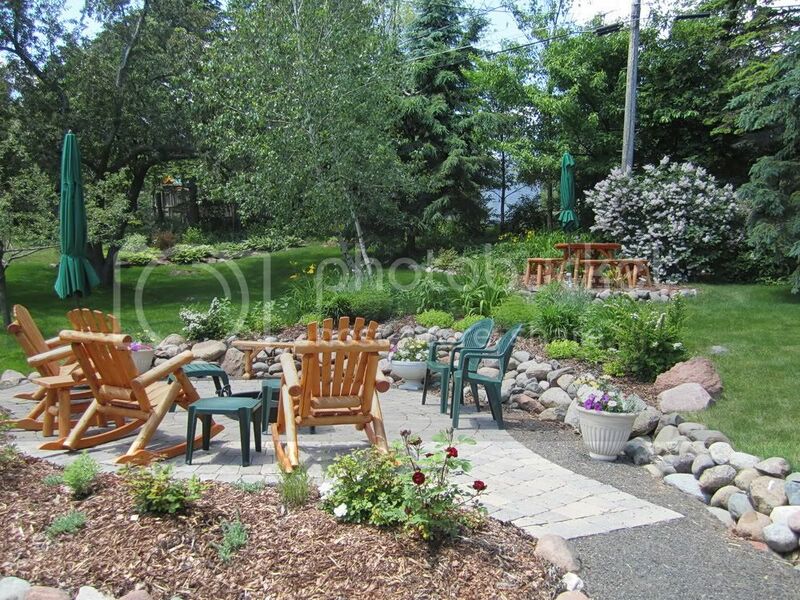 I would love to be able to sit out on your patio and take in the fresh sights and smells.. *sigh*. Well done! What a lovely garden you've created.